Just some stray observations since I doubt anyone is going to want to follow me through this journey regardless of how long it takes (and boy it may take a while). Robert Jordan all like, "Here's fifty characters! Ten of them are main characters. Ten are moderately significant characters. Seven are only there for a scene in which they say or do something you need to know about, sixteen are there to give some texture to the setting. Eight are utterly unimportant. Five are immediately interesting, nine are annoying, ten are memorable due to some detail in their description, twelve are boring. You'll figure out which is which eventually. Good luck!" This is the clearest evidence I've found so far for how much faster I used to read, and I'm genuinely dismayed. All I've done so far is skim - not read, skim - through the first four chapters and the time I've spent on it makes the rest of the book look downright intimidating, not to mention the next eleven (twelve?) books in the series of equal or greater size. I must have been around fourteen when I first discovered this series, and I used to plow right through them. I know I've read at least some of them multiple times. How does that work? Everyone knows we owe Game of Thrones to A Song of Ice and Fire. It could be argued that we owe A Song of Ice and Fire to The Wheel of Time. Epic fantasy, the kind composed of multiple consecutive doorstops and no spin-offs or guest authors, didn't really become popular until Robert Jordan began churning them out. (He also popularized "WHY IS THE NEXT BOOK TAKING SO LONG, THAT CLIFFHANGER IS KILLING ME".) 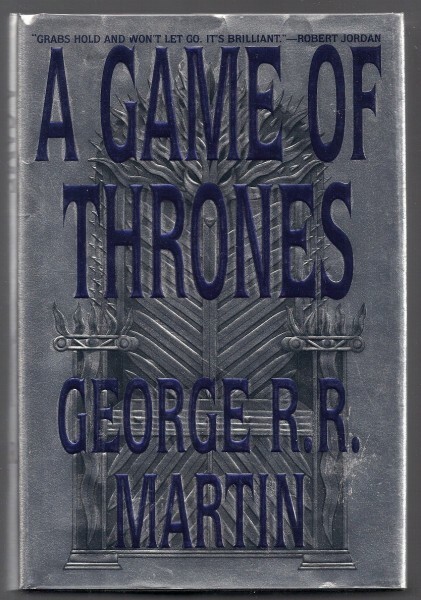 Lately, GRRM got nostalgic about the first cover to A Game of Thrones - not the first copy I owned, but the first one I read. Check out whose rec is on top. I just love the little icons at each chapter's header. I had forgotten about those. Dice it's a Mat chapter, wolf, you get Perrin. The Wheel + Great Serpent could be anything, and is apparently copyrighted. What are the crows, I wonder? Even when I thought these books were the pinnacle of fantasy literature, I noticed a couple of annoying devices that I soon decided I would never, ever employ in my own writing. One was the characters' oft-repeated observation that their adventures aren't like "the stories" - substitute "movies" or the Sansa Stark version "songs" depending on your setting. The other was the use of light and darkness as metaphors for good and evil. They're both this author's favorites, and they show up early, although at this stage it's mostly "Oh it's an Aes Sedai, like in the stories" for the former. The latter is in no short supply. Not sure how to keep track of the forces of evil? You don't have to. They'll have the word 'Dark' in their name. Jordan apparently feels the need to assign a love story to every. Single. Character, and none of them ever do much for me, but I think I really like the way Rand starts out with a girlfriend and the cracks are already showing. Makes it much harder to predict who will end up with whom. I studied the map for a while and didn't really remember any part of Randland's geography except for the Two Rivers and the Spine of the World. However, I do think I deserve accolades for remembering most of the weird pronunciations that Jordan puts on his invented words and names. (Cairhien? Nynaeve? Angreal? You're just doing this to mess with us, aren't you?) I haven't even cracked the index yet, hoo-boy. One thing he named well, though, was the series. I mean it! Short and sweet, nice ring, referenced often in the books, good use of symbolism. The wheel in question is actually a spinning wheel: time isn't just rolling along, it's creating. And considering the sheer length of this collection is its defining feature, pointing out the time investment gives it a meta layer which makes me feel oddly warm about it. The other books I'm reading right now are The Silmarillion (still!) and The Three Musketeers. Probably a good time to not have any comics, though I do miss Squirrel Girl.